Roseola is a common viral illness in children from 6 months to 3 years of age. In practice, I often see children with cases of roseola around 12 month old. There are two viruses that cause roseola giving two clinical presentations. Classic Roseola is caused by Human Herpes Virus 6 (HHV 6). 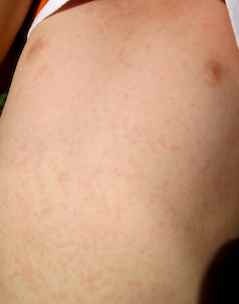 With HHV 6, patients typically have 3 to 5 days of high fever (102 to 104) and then a rash presents. HHV 7 (Human Herpes Virus 7) roseola is similar, but the temperatures tend to be lower. Importantly, the fever ends and then the rash appears. The diagnosis of roseola can only be made by the clinical appearance of the rash. When the rash appears, children with roseola are no longer contagious. 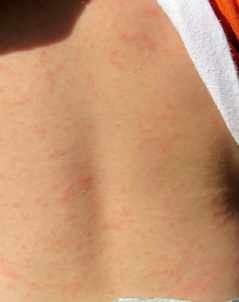 The rash often appears when children get hot - running around outside or when placed in a warm bath. I often joke that roseola should be renamed “The Great Frustrater” as it does not harm children, but is drives parents and pediatricians nuts.